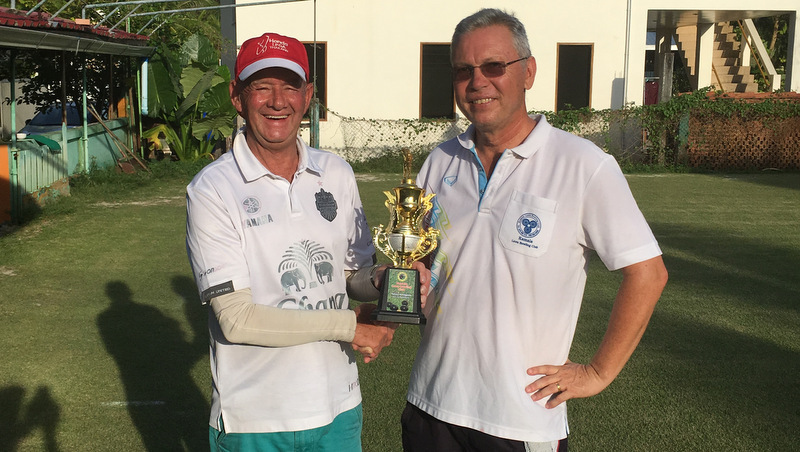 BOWLS: With high season now upon us it is also the ‘season’ for the series of ‘Major’ Championships being held at the Kamala Lawn Bowls Club. First up, was the Club Championship 2018 held late last month, when 12 bowlers competed for the trophy. The initial rounds were in a league format, the winners of each league progressing to the semifinal knockout stages and ultimately the final. After several tough games in the scorching heat the group winners were four of the pre-tournament favourites Dean Lambert, Ulf Egerstad, George Sasonow and Rob Knight, Representing Australia , Sweden. Russia and England respectively. Both semifinals were tight games buy Ulf and Rob prevailed to go through to the final. Defending champion Ulf looked like he would go on to win again as perennial losing finalist Rob struggled to find his line in the early stages and with four ends to go Ulf looked an odds-on winner as he led convincingly 9-1. Some of the crowd left early as it seemed only a formality for Ulf to go on and claim yet another crown. Rob had other ideas and once in control of the jack pegged it back to be only 9-7 down at the final end. Still a big ask for Rob, but amazingly he scored the maximum 4 shots in the final end to break his duck in the majors and prevail 11-9. The early leavers were amazed to discover Rob had won and Ulf commented that it seemed he too had left early too. So Rob Knight finally claimed a ‘Major’ and Ulf was left to rue losing from such a seemingly dominant position. Hot on the heels of the Club Championship was the prestigious Kamala Open, the second major of the year, competed last Sunday (Nov 27). Once again, the format was four leagues, with the winner of each league moving forward to the semifinals stage. Progressing from the ‘group of death’ was defending champion George Sasanow whilst springing a surprise in group two was relative newcomer to the sport Ronald Rietzscher, who had finally reformed his bowling delivery to a superb smooth action. Also stunning was the form of ‘The silent assassin’ Kenta Lindbergh, who came through an equally challenging group, whilst Ulf Egerstad continued his fine form in majors to top Group 4. The draw paired Ulf and George in one semifinal whilst Ronald faced Kenta. Surprisingly, both George and Ronald won their semis with ease, the spectators expecting much closer games. Well as we know, in sport, nothing could be taken for granted and so it proved. A nip and tuck affair developed which went to a sudden death extra end only after George had kept it to a score of 1 to Roland with his final bowl on end 10. So to sudden death they went and after several bowls of high quality George bowled an absolute snorter to claim his 3rd Kamala Open title by one shot 7-6 in extra time. Congratulations to George who lifted his third Kamala Open title in six years! 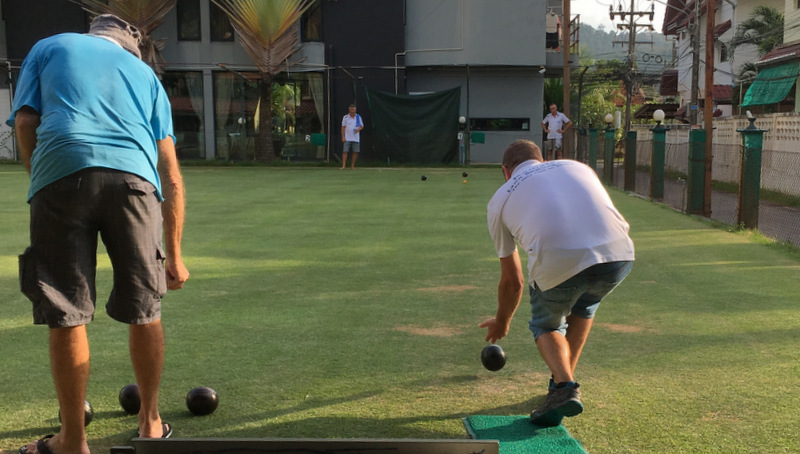 Kamala Lawn bowling Club “The only one in Phuket” is open six days a week. All equipment provided. 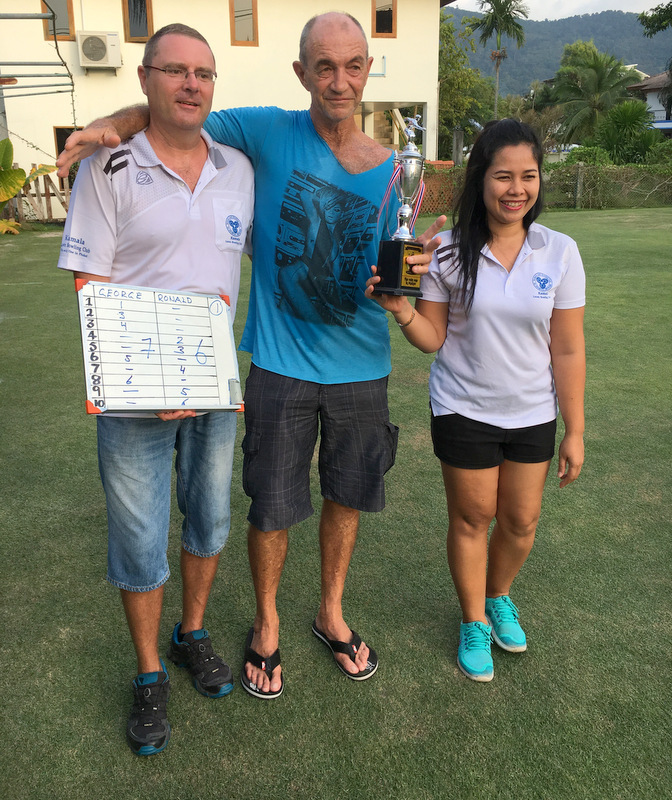 For further details on lawn bowls in Phuket, contact the club at 099-1307255.